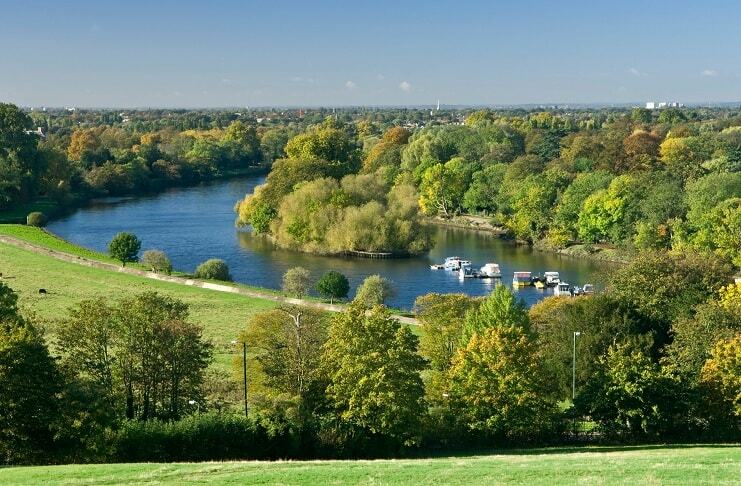 Richmond Hill is a small district situated at London Borough in Thames, England and is famous for having the best view in London; this stunning view was loved by the painter, Turner and inspired many other artists. Richmond Hill is now perhaps more famous for the people who live here: It is home to Pete Townsend of the Who, Mick Jagger and Ronny Woods of the Rolling Stones and David Attenborough. Richmond Hill is an excellent place to stay in West London with a selection of great hotels and also just a short walk from Kew Gardens The Royal Botanical Gardens with plants; Twickenham which is the location of the International Rugby Stadium and museum and the towns of Richmond, Kew, East Sheen, Barnes and Twickenham all have some excellent restaurants and pubs. Wimbledon is famous for British Lawn Tennis. 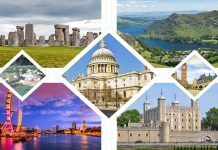 The sight of Thames Valley, located below the Richmond Hill and at the most beautiful section, where the river bends round towards Kingston where tourists can spot some small but splendid islands and Twickenham across the river, some moored boats are also found there. The beautiful Richmond Bridge to the right and the gates of Richmond Park just a few hundred yards away. The Terrace extends for several hundred yards, with a wonderful view from its entire length and many wooden benches to sit on, and maps in front detailing the various points of interest in the view. From the terrace of Mick Jagger’s house we can see a small and beautiful pub “The Roebuck” whose drinks make the day special and an enthralling one. The view is the best in London, virtually unspoilt by buildings, with the stately home, Ham house visible, and just a short walk along the tow-path. Parking is difficult on Richmond Hill, where it is mostly restricted to residents, but free parking is available in the park. Traffic on summer weekends is terrible, so coming by train or bus would be far better. It is free to visit the hill and the terrace, and inexpensive food is available nearby, or very expensive beer from the pubs on the hill. Richmond Hill is home to many famous people including Pete Townsend the songwriter and guitarist like Mick Jagger from The Who (lives at “The Wick” on the Terrace) and Ronnie Wood of the Rolling Stones, the multitalented David Attenborough who is most famous for his BBC Natural History programmes and a career spanning 50 years and his older brother Richard Attenborough, the film director. A beautiful village with good restaurants a train ride away from Richmond. This small and splendid district was originally named as Sheen which got renamed before Queen Elizabeth moved into the Palace and the town changed its name to Richmond. East Sheen, is a short walk away, next to the park and also holding a chain of independent restaurants serving good foods and services. The main gate of Kew Gardens is on Kew Green. This ancient green has a good selection of architecture, restaurants and bars, but is spoilt a little by the big road running through it and over Kew Bridge. Next to the river near Kew Green. Three excellent old riverside pubs.